Cuts and lacerations are caused by sharp objects and are usually the result of accidents. You may sustain this type of injury while performing your job, when cooking or if you fall down. Additional concerns for children include sharp edges of furniture that they may run into while playing. Cuts are defined as separations of connective tissue and are characterized by smooth edges. Lacerations generally have a torn or jagged appearance. No skin is missing in either type of injury. 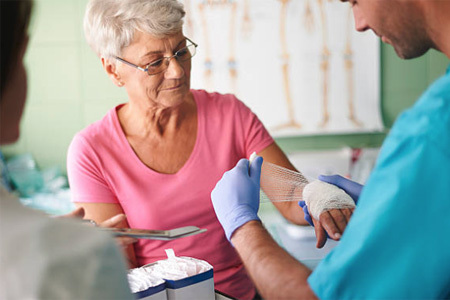 Very deep wounds should be checked by a doctor to determine if medical adhesives, tissue glues or stitches are necessary to facilitate healing. Your doctor may also test for nerve or muscle damage if a cut is severe. The top priority in treating cuts and lacerations is to stop the bleeding if it doesn’t cease on its own. Wash your hands and apply a sterile cloth or bandage to the area. Use gentle, firm pressure and elevate the injury above heart level. If the bandage soaks through, put another one on top and continue applying pressure. Bleeding should stop in 15 minutes or less. Cuts should also be rinsed with clear water and cleaned with mild soap. If dirt or debris remains inside, use sterilized tweezers to remove it. Apply antiseptic ointment and dress the wound with a clean bandage that completely covers the area. Change the dressing daily until a scab forms. The doctors at an urgent care center can care for the wound and take steps to facilitate healing. They can also determine if you need a tetanus booster to ward off potentially serious side effects.